I'm working on a DVD of the documentary and as yet there's no release date planned. 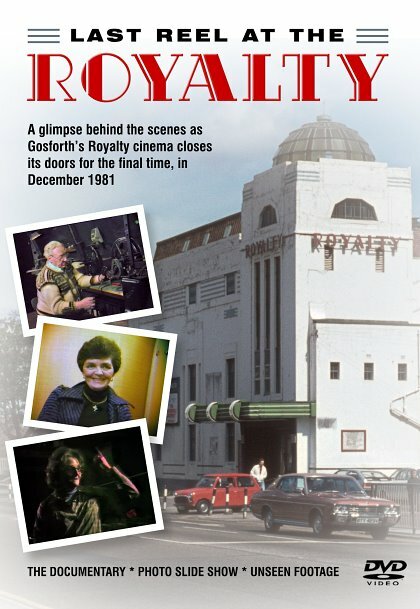 Originally the intention was to release the DVD in time for the 30th anniversary of the closure at the end of 2011. But, in the end, due to work and other commitments I couldn't manage it without greatly reducing the number of extras. Instead, rather than rush, I decided I would wait until such time as I'm able to include everything I want to. A professional DVD manufacturer will handle the physical production of the discs. This means a proper colour-printed disc in a cellophane-wrapped, full-colour case. The price is expected to be around £10. The disc will include the remastered documentary, which was completed a couple of years ago, with a few minor tweaks here and there. In particular the film footage of the demolition has been retransferred for better quality. Plus an exciting selection of extras! These are still to be finalised but will include slide shows of photographs and much video and film footage that has never been seen before. Here's the DVD box front cover. On the final evening, up in the projection room, I asked John Tessa what would happen to the equipment if the cinema didn't reopen. Without another word, he picked up the Royalty's two film joiners, thrust them into my hands, and said "take these". He also gave me a projector reel and two cans of film. One small can contained a Ministry of Information "Food Flash" from the Second World War. Unfortunately this was on nitrate film and within months had deteriorated into a sticky (and dangerous) mess and had to be thrown away. It seems the sudden change of environment had triggered this in a film that had survived in the Royalty for 40 years. The other can contained a 400ft colour reel of cinema advertisements (running time about four-and-a-half minutes). Thirty years later, I still haven't had the opportunity to view this reel. But I can see that one ad is for a car dealership and another for "The Model Shop". I felt bad taking away anything from the Royalty. But I'm sure John had seen the same situation many times during his career. 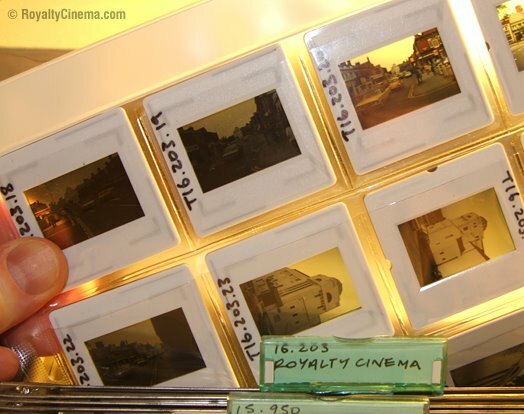 The fact that he gave me both film joiners suggests that he had given up hope of the Royalty reopening and I suppose he knew that these items might just end up in a pile of rubble. Other people who were around during the final days seemed to leave with quite a bit of stuff (with John's permission I'm sure). I believe some of it ended up at the Wallaw cinema in Blyth which, itself, is now closed. As I've said, at the time, I felt that it was somehow distasteful to remove items . In retrospect, I wish I could have saved more myself. But of course everything belonged to the owners of the cinema and I was busy making the documentary. One day, the following spring, I received a call from 'Etta Eastlake (the former manageress). She was was meeting John Tessa and June Oliver in Gosforth. They planned to go inside the Royalty and would I like to join them? Once inside, we discovered that vandals had been in. John came down from the projection room to tell us: "they've smashed the Cinemascope lenses and ripped the screen." I'll never forget the note of anguish in his voice when he said that. 'Etta Eastlake said she didn't feel safe and we should leave. I had my camera with me but couldn't bring myself to photograph my friends as, glumly, they surveyed the damage. However, I did take one picture outside (above) and that was probably after we'd been in. When I showed the video for the staff on 14 July 1982, we met outside the building but didn't go in. They posed for photographs with the reel that John had given me and one of the joiners (photo right). The Evening Chronicle reported the screening of the documentary as "Royalty's ultimate weepie". 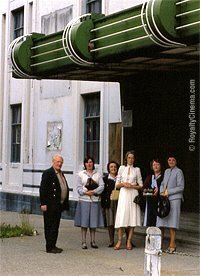 Soon after there was a second showing for usherette LilyLockey, who couldn't attend the first and, again, photos were taken outside with the famous reel. I have a second projector reel too and can't remember at which point I acquired that. It's a less attractive design. Two years later, on a Sunday afternoon in May 1984, and just after demolition had begun, I sneaked into the building to shoot some film and photographs. Various equipment and items had indeed ended up being left there. On the floor of the main foyer I found the front of the ticket machine that Mabel Chappelhowe had talked about in the documentary and shown to camera. I salvaged it and here it is today. Although the demolition was distressing, it revealed some of the history of the building. The huge green canopy that had been over the main entrance lay on the ground upside down. Part of an earlier structure could be seen, with the word "cinema" cut out in an art-deco typeface. I would guess the word was backlit from inside and this strongly suggests that the colourful neon lighting on the canopy didn't date from 1934 but was a later addition. Perhaps from the 1950s? Inside, with sunlight streaming through holes in the roof, the once dimly-lit auditorium could be seen as never before. 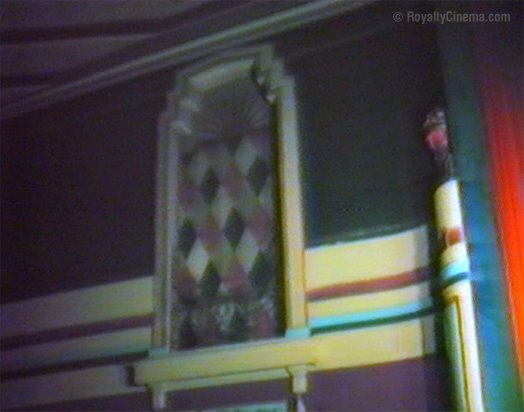 The decor had been in good condition when the cinema closed. But now the paint was peeling in places. The colours that can be seen underneath are probably the original pink colour scheme from 1934. 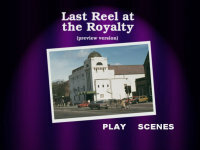 The DVD will include animated slide shows with around 120 original 35mm photographs: shots of the Royalty during its last few days, the demolition and some of other Newcastle cinemas which were taken in spring 1981. Most of these have never been published before. This is the Ferguson Videostar camera that I used to shoot the documentary and that's me behind the lens. The separate "portable" recorder used full-size VHS cassettes and rechargeable batteries that were about a foot long. This didn't come cheap in 1981. The equipment was hired on a longterm basis from Radio Rentals and cost £50 per month -- equivalent to £150 at today's prices. I'm not sure how much it would have cost to buy but, at the time, you could expect to pay around £900 (£2,700 today) for an ordinary home video-recorder. A three-hour VHS tape cost £10 (£30). As well as this I was paying about £20 each month for a second top-of-the-range video-recorder for editing (copying from one machine to another was the only way video could be edited). Together with my dad, I'd set up a small business called Video Replay and we made videos of weddings and other events. This covered the rental cost and meant I had the equipment available for other things -- such as the documentary about the closure of the Royalty cinema. The sound quality on the portable recorder was good, but it made a loud "clunk" whenever it was started or stopped. Pictures needed plenty of illumination and in anything dimmer than sunlight "ghosting" would be visible on the shots. I used two 500 watt lamps for many of the scenes inside the Royalty, but the dark decoration and cavernous spaces simply swallowed up the light. Nevertheless, this was exciting cutting-edge home-video technology at the time and being able to make your own TV programmes seemed like nothing short of a miracle. 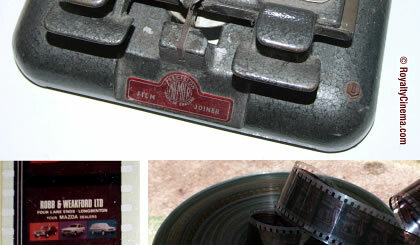 I've been working on the digital cleanup of the 35mm negatives and slides. 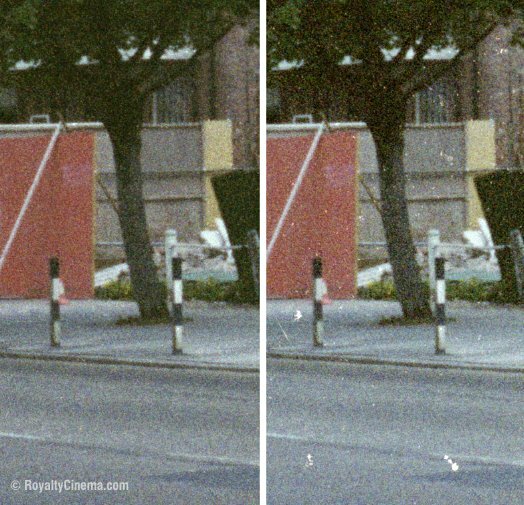 This involves removing any dust spots or scratches -- which appear white on scans from negatives and black on those from slides. This has been a huge job. There are about 125 photographs and some individual shots have taken 45 minutes to do because there were so many dust marks on the colour negatives. It could be my fault as a photographic beginner back in 1981. However the slides and black and white negs are much cleaner. So I wonder if some of it dates from the original "happy snaps" high street processing? Then the colour negs went back to the lab in the mid-1980s when Newcastle Libraries paid for a set of prints for the archive. But I decided that this was something that had to be done and I might as well do the best job possible. It really is amazing what you see when you remove all the spots. It's like cleaning a dirty window and seeing the view properly.